The Renault Megane RS265 Cup. WHEN the 100km mark on the speedometer is positioned far to the left of centre, you know you are sitting in a fast car. This Renault Megane RS265 is certainly that. Built at the request of the Gendarmerie - the rapid intervention component of the French police - the RS265 combines Renault's racing prowess with first-rate engineering and renowned Parisian flair for a car that looks magnifique and drives even better. It is in essence a revamped version of the RS250 with an added 15 horsepower (11Kw), retuned suspension and redesigned front plate but in reality it is a much-improved drive. The interior of the RS265 is nicely demure with just hints of its sporting pedigree rather than the flashy boastfulness of some rivals. Bucket-like Recaro seats with their ample bolstering and clever curves give an indication of the thrill ahead and also help to find a comfortable driving position. The dash is uncomplicated with the buttons and dials much improved especially on the fiddly audio interface. 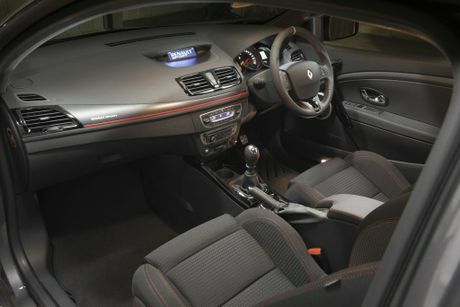 Materials look more like quality choices with the carbon fibre fabric trims on the door panels quite a stylish addition. The steering wheel is chunky, the gear stick nicely formed and the clutch and brakes pedals well spaced even for husbands with big feet. The tacho now sports a white background instead of that cheerful yellow and there is also a digital speedo to keep you on track. The rear seat is squashy but can fit two car seats and while a sloping roof restricts headroom there is reasonable space for adult legs. You would be wise not to hold your breath for boot space in cars of this type but this one is pretty decent (344 litres) with more available if the back seats are folded. Buckle up and hold on, this is going to be an awesome ride. The RS265 travels beautifully delivering an effortless, well-balanced and thrilling drive. Renault's engineers have given the RS265 a mechanical slip differential and independent front steering axis - a masterstroke which amazingly results in no torque steer even when powering out of corners. She sails along this car, finding the power you need without breaking a sweat, darting in and out of traffic with ease and then singing lustily when you give her legs on the open road. We kept our test car in "Sport" mode for most of the week preferring the sharper responses and tighter steering. The gearbox is smooth with the wide torque band helping to keep the gears nicely spaced out and the clutch takes from middle or thereabouts. Wider tyres give plenty of grip with the RS265 assured even in the wet. The French Gendarmerie are a lucky bunch. Hot hatches have been the flavour of late with the Golf GTi (from $40,490), Ford Focus ST (from $38,290), Mazda 3 MPS (from 39,490) and Subaru Impreza WRX (from $39,990) presenting as the serious rivals. If the RS265 can't open the eyes of Australian motorists to the charms of the French manufacturer then nothing will. This car is a thrill to drive with its superior dynamics and classic style. We'd have one if we could find someone to take the kids. What we liked: Fun to drive, hot to look at. What we'd like to see: Reverse camera standard across range and a few more storage options. Available with a manual gearbox only which may be a problem for some people. Warranty: Renault offers a three-year/unlimited kilometre warranty and three-year/30,000km fixed-price servicing. Model: Renault Megane RS265 Hot Hatch. Details: Three-door front-wheel drive hatch. Engine: 2.0-litre four cylinder petrol generating maximum power of 195kW at 5500rpm and peak torque of 360Nm at 3000rpm. 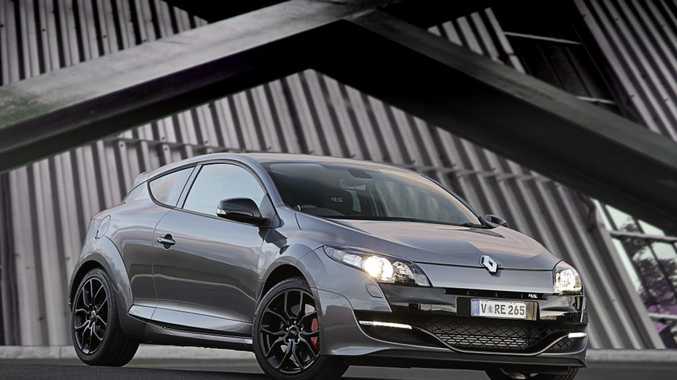 The Renault Megane RS265 Cup edition.